MODwedding is the perfect advertising avenue if you are looking to expand your presence online with our 800,000 monthly readers. With our loyal 1 million + brides across our social networks, your brand will be exposed to sophisticated couples who are in the midst of planning their dream wedding. MODwedding influences couples in every scope of their wedding. By partnering with like-minded brands who also want to deliver high-quality inspiration, our readers are exposed to newest feature collections, top honeymoon destinations and beyond. 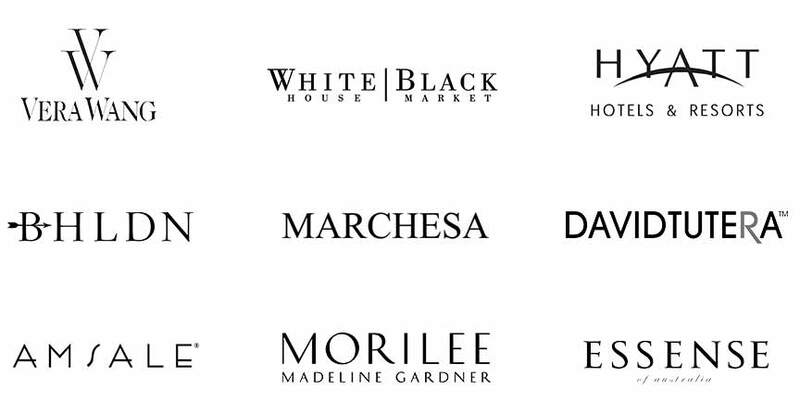 MODwedding is honored to have worked with these fantastic brands. Vera Wang, Justin Alexander, Hyatt, Mon Cheri, Marchesa, White House Black Market, Elegant Wedding Invites, Basic Invites, Morilee, Sophia Tolli, David Tutera, Essense of Australia, Martina Liana, Grace Loves Lace, Diamond Mansion, BHLDN, Jenny Yoo, Amsale, Rescue Flats, Eddy K, Kelly Faetanini, Paloma Blanca. We provide creative advertising solutions for every brand and strategically recommend the best promotions for each unique advertiser. Whether you’re an established brand or just getting started, we will customize a Bespoke Package to help you reach your marketing goals within your budget. Below are some of our most popular advertising solutions. Get front page exposure and introduce your brand through editorial coverage and social media promotions via Facebook, Pinterest and Instagram. Our Facebook page has grown to nearly 1M followers! Get noticed with posts that link directly to your website. Reserve a dedicated board to make your brand stand out even more on our Pinterest page! Your pins will never get buried among others in your category. For newer or smaller brands on a budget, we offer editorials with social media promotions to get noticed in a roundup article alongside other brands. Our brides are looking for the best vendors to bring their dream weddings to life. Become an exclusive member and get on their radar with a 12 month listing and one introductory Facebook blast. Thank you for your interest in working with MODwedding. We look forward to collaborating with you.